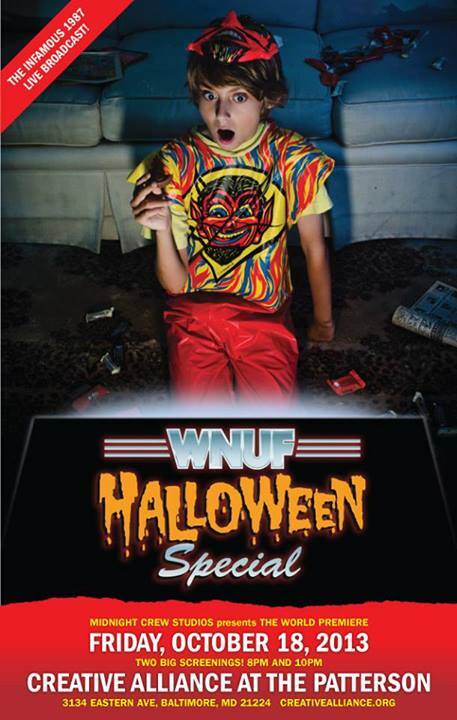 The conceit of WNUF Halloween Special is that this film could have been recorded from the TV and distributed by anyone who saw the original broadcast. Between news package segments, the film has “commercials” crafted by LaMartina, his assistant editor, and fellow Baltimore filmmakers from both original and archival footage. Furthermore, to reinforce their story, George and LaMartina decided to distribute the film on VHS tape first, labeled simply with “WNUF Halloween Special.” Copies were tossed out of car windows and left in bathrooms of various East Coast VHS conventions by LaMartina. “The whole idea behind the project was that this was a found footage tape you found yourself,” George said. The film will receive DVD distribution later this month by Alternative Cinema, but George said that LaMartina originally asked a colleague to tape personal copies of the VHS for distribution. They then downgraded the movie by re-recording it from one tape to another, a process which results in a decreased quality called “generational loss,” resulting in a more authentic aesthetic. While VHS was still around, people would pass around tapes and re-record their own versions for personal home viewing, George said. “Those are the original viral videos,” he added. The Creative Alliance premiere poster. Together, Jimmy George and Chris LaMartina have made six feature films, all of which have distribution and have premiered in Baltimore theaters. While all of their films have focused in the comedic-horror genre, George described this movie as their “most accessible film.” “I think my grandmother would like it if she were still alive, and there is no other movie I’ve made where I can say that,” said George, laughing. “We make horror movies because there is an audience for low-budget horror,” George said. Together, George and LaMartina will write a script only after having come up with a title, logline, and tagline, which are considered the more marketable aspects of a film. This insures that a movie will have an audience built-in from day one. “The only stories worth telling have a viable concept,” George added.